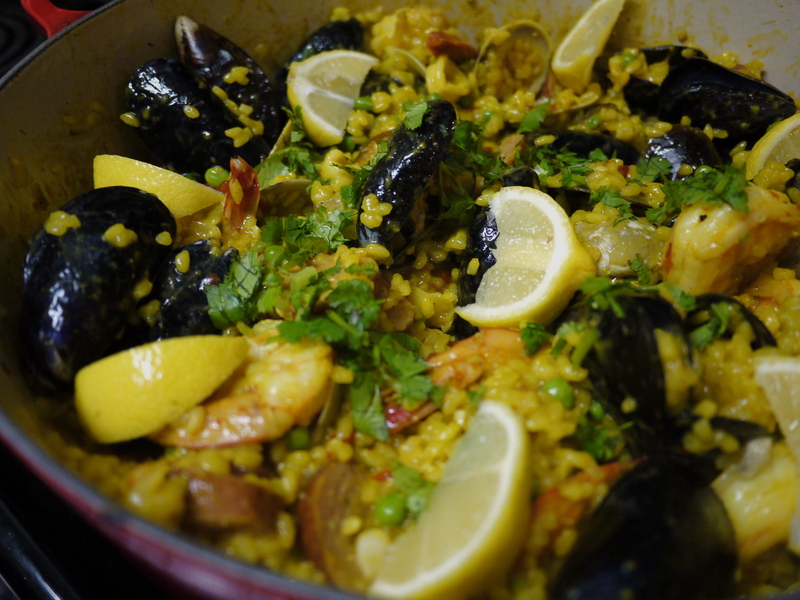 seafood paella is an annual tradition of mine. the steps of making paella are extremely easy, but washing, cutting, and sauteing everything separately is too time consuming that i only have the energy to do it once a year. the process takes at least 2 hours from start to finish. i used to make my paella in a special paella pan, but i could never get the socarrat (or crispy bottom) right, so i gave up and decided to switch to using my le creuset this year. if anyone knows how to make the socarrat without burning the rice, please teach me! 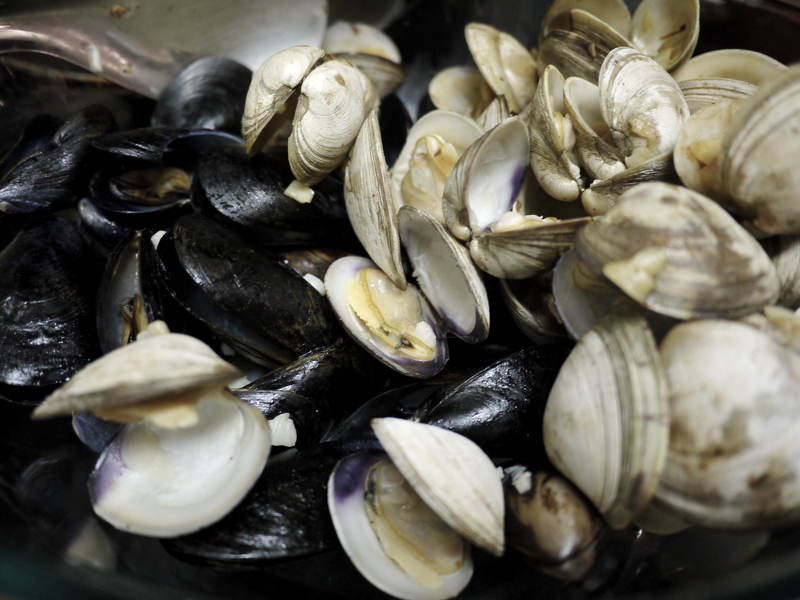 Take 1 teaspoon of the minced garlic and saute the mussels on medium high until the shells open, set aside. Repeat with the white clams, then shrimp (until pink), then squid. In a french oven, saute the onions with the remaining garlic in EVOO on medium high until done. Add rice and stir for roughly 30 seconds, or until all the rice is somewhat covered in oil. Add 2 cups of the seafood stock and saffron threads. When the saffron threads are dissolved and the stock is boiling, reduce the heat to medium. Continue stirring and periodically add 1 cup of seafood stock as the rice begins to soak up the liquid. Cover the pot occasionally to speed up the cooking and keep the flavors in. This process will take at least 30 minutes. Once the rice is fully cooked, add the frozen peas and chopped sausage to the pot. Season with S&P and crushed red peppers (to your preferred degree of spiciness). Stir the seafood back into the pot. Garnish with roasted red peppers, cilantro (or parsley), and lemons. would it be faster with a sous chef? what if you had a retarded wannabe gangsta sous chef though? you don’t think he’d slow you down a lil bit?